Another new project in my long list of "Unfinished projects"! And another thing in my long list of "Things I just had to have"! I bought this house from a retired colleague of mine. He and his wife found it in one of their antiques hunting trips in Sweden. It is a selfmade house, probably from the seventies. I like the shape of the house very much. 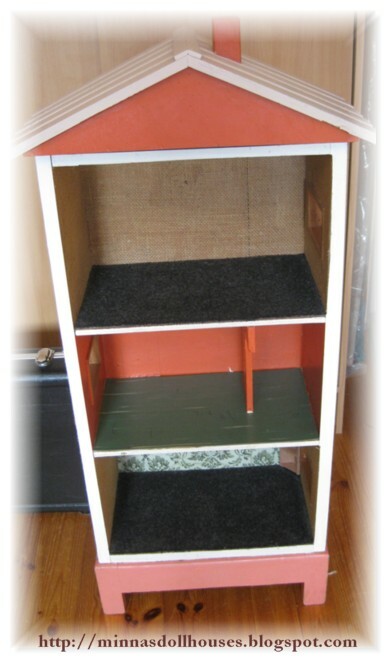 It stands on a nice base which is why it is easy to keep it on the floor, and it does not take very much space. The house is one meter high and about 41 centimeters wide. It is very sturdy, but it is in a very shabby condition. However, as it is going to be the house of the Witch, it is perfect as it is for that purpose! Yksi projekti lisää pitkälle "Keskeneräiset projektini" -listalle! Ja yksi asia lisää pitkälle "Tämä oli pakko saada" -listalleni! Ostin tämän talon eläkkeellä olevalta työkaveriltani. Hän ja hänen vaimonsa löysivät talon Ruotsista, jossa he käyvät vanhojen tavaroiden etsintäreissuilla. Talo on itse tehty, ja luultavasti seitsemänkymmentäluvulta. Tykkään talon mallista tosi paljon. Se seisoo kivalla jalustalla ja se on helppo pitää lattialla, ja se ei vie kovin paljon tilaa. Talo on metrin korkuinen ja noin 41 senttiä leveä. Se on hyvin tukeva, mutta aika ränsistyneessä kunnossa. Mutta koska siitä tulee Noidan talo, se käy tarkoitukseensa mainiosti sellaisenaan! wow- I really love it! I can't wait to see what you do with it- you are right- it is the perfect shape for a smaller space! How exciting Minna!! Great looking house. The witch will love it. The house looks nice and very well made. It will be fun for you to make it perfect for a witch and fun for us to see your progress. I can't wait to see what you do with it either! Very intriguing shape! This house is so lovely! Cool idea to make a house like a "tower". I can´t wait to see the witch moving in.